Palm Treo news, forums, cases and accessories, since 2002. Here’s a first look at the HP Veer 4G, coming to AT&T on May 15th at a price of $99.99 (with a 2-year agreement). Our first impressions are as you’d expect, the Veer is surprisingly small. The keyboard is reminiscent of the Palm Pre Plus keyboard, but improved. 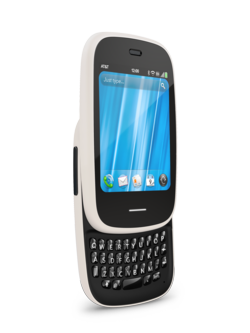 It is smaller than the Pre keyboard, with the keys roughly the size of those found on the Pixi Plus. The magnetic latch is a welcome addition. No more USB doors to fiddle with and the latch attaches with ease. The back of the HP Veer is a hard plastic, slightly different from the Touchstone backing on the Pre. We haven’t spent much time yet with the Veer, but build quality appears to be pretty solid throughout. The sliding mechanism is very smooth and quiet. The HP Veer is the antithesis of today’s smartphones. In a crowded field of large screen devices, the HP Veer dares to move in the opposite direction, with it’s impossibly small stature. Thanks to it’s small size and support for lanyards, it could have wide appeal to those looking for wearable tech or those looking to avoid the bulk found in other larger phones. It’s not a word I use often, but the Veer is “cute”. I can say with certainty that we won’t see Veer commercials with F16’s bombing corn fields. Stay tuned for our review in the coming week. Yes, the day is upon us. 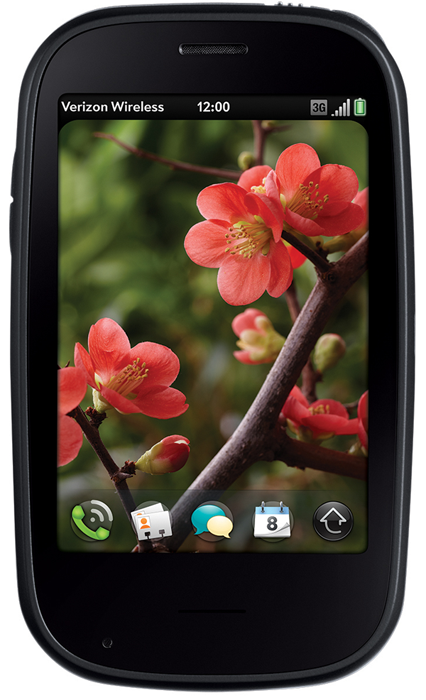 The first HP branded webOS device, the Veer 4G, will be available on AT&T starting on May 15th. The Veer will be available in both black and white. 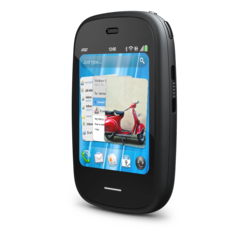 Priced at $99.99 (with a new 2-year agreement), the Veer is one of the smallest smartphones available. Early reports are that despite the small size, the Veer 4G is a very powerful little phone. So are you jumping for the Veer or waiting for the upcoming Pre 3? That’s the question facing many Palm faithful coming May 15th. Good news for those of you who live in Europe. webOS 2.1 is available for the German Palm Pre Plus. Updating is not your typical OTA variety, but requires you download the webOS 2.1 doctor from their site. Bad news for those of us stateside, as the doctor will not work with Pre Plus phones on US carriers. There is a movement in place that will allow you to modify the doctor for use on your phones, but appears to be in the alpha stages. Still no word from Palm on their plan to “make things right“. One would assume webOS 2.1 runs perfectly fine on Pre Plus devices, given an official release in Europe. While we applaud the efforts of webOS Internals, there really needs to be an official release available from HP. For most, updates that require terminal entries is far from a realistic upgrade path. We all knew it was coming, but Verizon today dropped the press release for the HP Pre 2, which features webOS 2.0. Full presser and specs available after the break. The HP Pre 2 is priced at $149.99 (after a $50 mail-in rebate) and a new 2-year agreement. It is available starting on February 17th. We have to say the price is a bit surprising. Both the Verizon iPhone and the HP Pre 2 will carry a $199.99 in-store price tag before rebates. This could spell tough sledding for the Pre 2. HP technologies. The “Anthem” ad uses the classic Lou Reed song “Take a Walk on the Wild Side”. HP TouchPad Priced at $699, Coming In June? BGR is reported that his sources say the HP TouchPad will launch as early as June with a $699 price tag. It’s not clear if this is a 3G model and whether it is the 16GB or 32GB model. The 16GB WiFi iPad retails for $499, while the Motorola XOOM is rumored to be priced at $799. Details regarding the XOOM are also still vague. The exhaustive amount of feedback on blogs, Twitter and Palm’s own Facebook page saw a huge outcry from the webOS community in response to word that legacy devices (those prior to the Pre 2), would not receive an update to webOS 2.x. The Palm blog last night responded to the criticism. It’s still not clear as to when Palm (branding moves aside, this was a move by Palm) made this tough decision, but clearly the timing was not very well thought out. Yesterday should have been a day of positive vibes for the company, but was tarnished by the news. HP doesn’t have a solution yet to appease the community, but they are working something to ease the pain. 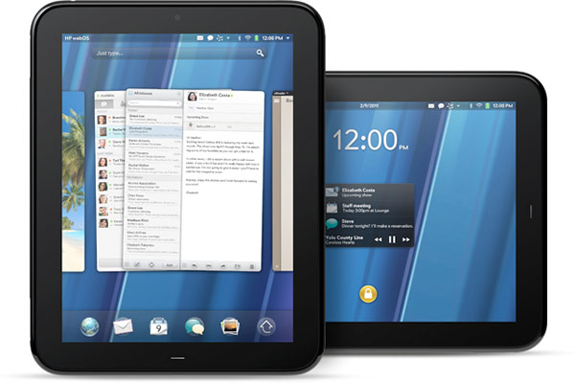 Our hope was that webOS 2.0 would help fix the sluggishness that’s present on current generation Palm webOS devices. It’s not clear if “making things right” will mean a webOS 2.0 doctor that allows us to update or perhaps some sort of voucher to purchase a future product at a reduced price. HP doesn’t have the answer yet, so anything on our end is just pure speculation. If I had to guess, a coupon for AppCatalog purchases might make sense. It would continue to stream cash to developers and customers having more apps would be less likely to flee the platform. How about you? What are you expecting from HP that will “make things right”? HP now offers the Verizon HP Pre 2 for pre-order on their site. The HP Pre 2 is priced at $99.99, with a new 2-year agreement. The HP Pre 2 starts shipping on February 17th. We were unable to locate the Pre 2 on Verizon’s website, so you’ll need to go directly through HP if you’re looking to order now. 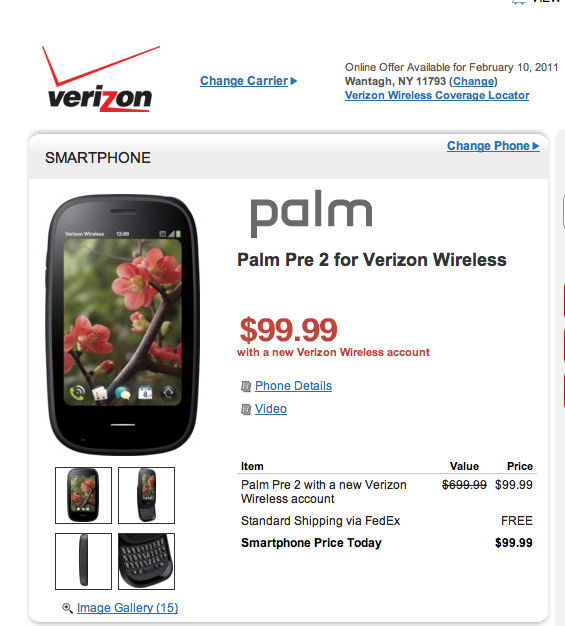 It appears the Pre 2 has also shed the Palm name. HP has just posted the entire video of Think Beyond event and we present it to you for your viewing pleasure. News is breaking that HP will not be releasing any OTA updates to webOS 2.0 for existing devices. So if you’ve purchased an original Palm or even a recent Palm Pre Plus, you will not be receiving an OTA update to webOS 2.0. The only path to that OS is to purchase a new device. What, what, whaaat? PreCentral’s Dieter Bohn reports that HP intends to launch a website in the coming months that “offers a path to 2.X”. 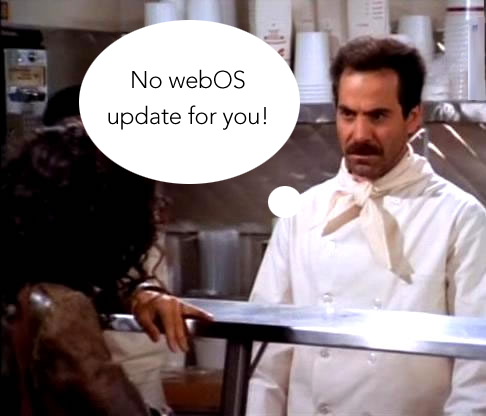 For months, we’ve all been hearing that webOS 2.0 would be available as an OTA download. The reason given has to do with major backend changes required that would have made it increasingly difficult to offer webOS 2.x to previous owners. And people though we were crazy when we talked about the fragmentation of webOS. This is just all sorts of wrong.